Beautifully illustrated, this is the charming story of a girl who spends a year with her grandmother on a farm at the edge of the South American Atlantic Rainforest. The child is from the city, but the time she spends with her grandmother teaches her about the seasons of the Southern Hemisphere and the beauty and transience of the rainforest—from the plant, animal, and insect life to the cycles of nature. Following them as they spend their days walking through the forest, lying on their backs under the trees, eating dinner outside, collecting seeds, and learning about the wildlife, this entertaining narrative is also environmentally sensitive in its approach. An illustrated, child-friendly glossary with sections dedicated to butterflies and moths, birds, bugs, and trees and plants concludes the book. 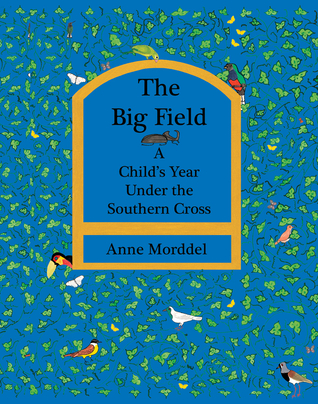 The Writing of The Big Field is great for a very young audience. The story is simple, and it slyly inserts a science lesson to its readers. Granny teaches her three grandchildren - the narrator, Chloe, and Baby - about nature around her farm. The various insects, birds, and plants of Paraná, Brazil are highlighted and discussed. As the book takes the reader through each month and the corresponding season, Anne Morddel weaves the flora and fauna that is active or in bloom into the story. At the back of the book is a glossary of the plants and animals that were featured. The story itself could be a bit confusing to children in North America, one of which I happen to live with (my daughter, Bug). If one was to pick up this book blindly and begin reading it, they might be a bit confused why summer began in January. Bug is six and just now learning about the seasons in our hemisphere, and the idea that they run differently in other parts of the world is ludicrous to her. Once we got past that hurdle, she was able to fall into the story. Also, while the focus of the story was more of the narrator's learning about and interacting with nature, Bug was a bit concerned about the sudden disappearance of Baby. After March, we never read anything else about the character. It is a minor detail, but one that concerned her. The Big Field is a picture book, so the Illustrations were a very important part of the story. They are done by the author itself (it never said anywhere, but they are signed "2005 AM") and look as if they are done with watercolors. The pictures are lovely, and Bug thought that some of them were very funny. (One of the characters' rear is sticking out of a cave in July.) I thought the birds and insects were well done, but there was too much white space and not enough story in the pictures for my taste. That being said, I'm not the target audience, and Bug liked the illustrations just fine. I think this book would be great for a child who loves nature and learning about new places. It was a quick read and a good starting point for me to talk to Bug about differences in various locations on our planet. 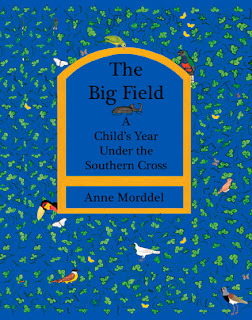 You can buy your copy The Big Field today! To satisfy FTC guidelines, I am disclosing that I received the book from literary publicity firm, JKS Communications, in exchange for an honest review as a part of the blog tour. This has in no way affected the outcome of my review. All opinions expressed are rambling, honest, and completely my own.